Life is who you know. Keith Gunn introduced us to his wife Jan. Jan plays tennis with a woman whose son works for the San Francisco Opera. He has access to seats magically available. All of this means we got to go see Lucia di Lammermoor this afternoon. Lunch comes first, and Jan likes Absinthe, a bistro on the corner of Hayes and Gough a few blocks from the Opera House. I’ve always wanted to try absinthe, the liquor. It has a storied past, banned in many countries, supposed to be hallucinogenic, addictive and mind warping. Much of that, it turns out, is because it ranges from 90 to 150 proof–you can get seriously wasted on this stuff in a flash. 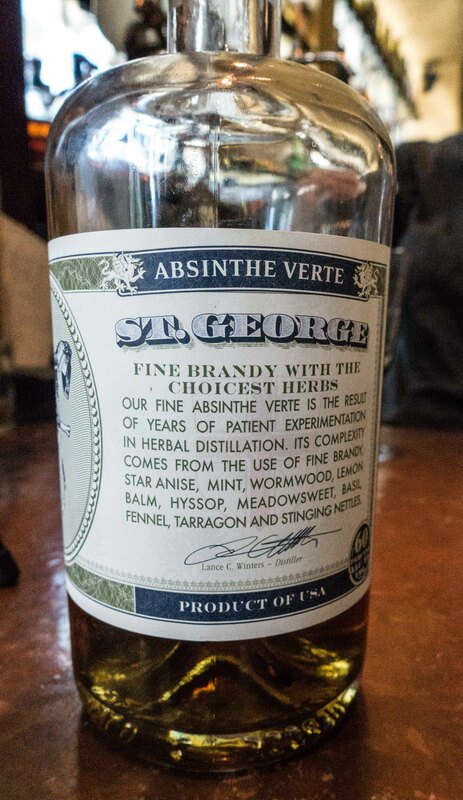 It’s legal now, and Absinthe (the bar) has a decent stock of Absinthe (the liquor). Getting a drink is a production–a shot is poured into a glass, then cold water is slowly dripped through a sugar cube. Of course they could just add cold sugar water from the refrigerator, but there’s no show business in that. How exotic can it be when it comes from Alameda? Where you go to find an absinther infuser is a question I can’t answer. In any event, the liquor tastes like black licorice. It’s cold, it’s sweet, it will knock you silly if you aren’t careful. I’ve had my glass, that’s probably enough for one lifetime. On to lunch. Gail and I started with the deviled eggs. I don’t know how to make an egg that color beige. All deviled eggs are good, and these were no exception. There are two things that are never left over from a party–deviled eggs and Oreos. If you put an Oreo in a deviled egg you would have the perfect food. Then I tried the spicy fennel sausage hash. Grilled cheese, fresh tomato, pesto. House made chips. I was happy. Service was excellent, prices are San Francisco high. Ambience like a fin de siecle Parisian cafe. And a wide selection of Absinthe (the liquor). I like this place. mesmo teor, quem queiser ler..